Nepal Foreign Affairs (KATHMANDU, 29 November 2018) – A group of Chinese investors from Yunnan Province of China said that Nepal is a good destination for investment adding that more Chinese investment is in pipeline from Yunnan province. At an interaction programme organized by Yunnan Province Representative Office in Kathmandu, the business leaders and investors from China shared that the Chinese business firms are working to set up the subsidiary companies in Nepal which will be a major step ahead for establishing contacts and investing in Nepal. On the occasion, Director of Yunnan Provincial Energy Investment Group Company Wu Lingcheng said that Nepal is a fine investment destination because of investment-friendly policies from side of government. The policies are good for investors as well, Wu shared. “There is a good support from the local partners and people and that’s crucial for investment while there is good potential in energy sector. This is good time for investment in Nepal’s energy sector, Wu said. Saying that they have also talked to the Chief Minister of Karnali Province Mahendra Bahadur Shahi, he added we aim to invest in the tourism sector in Karnali since there is higher prospect of tourism. “We have got a very good response from the Karnali Province Government,” Wu shares the response from the province government. He was of the view that local partners from Nepal will invest in joint venture mostly in energy sector, real estate, agriculture sector, irrigation project, water supply and some other key areas of infrastructures adding that 80 percent of the total investment in the projects would be from China. He added that the company has got the highest level of certification on research and design from Chinese government. Likewise, Economic Manager Yang Chan Yu of China Eastern Airlines said that China Eastern is preparing to increase its flights to Nepal in the near future. “We have 11 flights to Kathmandu from China in a week at present. Weekly flights to Kathmandu were slashed from 14 after the earthquake in Nepal. 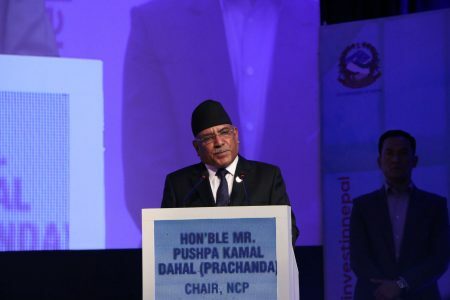 But, we are working to increase our flights due to more Nepal-China connectivity and rise in Nepal’s tourism,” he said. On the occasion, he said that the China Eastern Airlines would also begin its flight to Pokhara soon after the development of regional international airport in Pokhara. On the occasion, business representatives including Deputy Director of Kunming Engineering Corporation Niu Songtao and others from Yunnan Province of China expressed the confidence that Nepal-China relations would deepen further and investment from China to Nepal would increase in the days to come. The Government of Yunnan Province has also set up its office named Yunnan Commercial Representative Office in Kathmandu Nepal uniting almost all companies coming to Nepal for investment from Yunnan. The office is expected to exchange our ideas, exchange experiences and resolve the problems together and to ensure better performance in Nepal market. Meanwhile, a new delegation of business leaders and investors is also coming to Nepal to explore areas of potential investment areas.